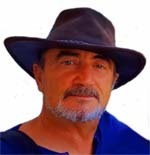 Abalinx 21 December 2017 Peter Adamis. Not many would know of this lady. But what I can tell you is that she is worth her weight in Gold and precious stones. In fact her blood is worth bottling. I first met Fay some two years ago in the middle of my chemotherapy. She would come into my room to clean it and in her shy voice say hello. Fay was no stranger to people with cancer. In fact she saw people come and go with many never returning or being moved onto palliative care one floor up in the cancer centre. Slowly my wife and I started a conversation with Fay which was reciprocated in her own gentle way. She told us her story and it touched us deeply. While I was in hospital on and off over a six month period I would always bump into Fay. She would bring me sandwiches, a cup of tea and if she had time would stay and have a chat. Fay did not have to do all of that but in my eyes she was an angel in disguise. When the final toxic chemotherapy flowed through my veins and into my heart to do the final cleansing Fay was there. When my stem cells were being reinstalled into me after having been harvested a month before and put on ice, Fay was there. When the specialist decided it was safe for me to go and removed the tubes, Fay was there. Fay and I exchanged emails promising to keep in touch. As the months went by communication became less and less even though I would visit the cancer ward during my periodical checks. I just could not find Fay anywhere. Today after lunch I made my way for the final briefing with the post stem cell dietician at the cancer wellness centre. After my meeting with the stem cell dietician, I left a message with the staff downstairs, the message was for Dr Simon He (Oncologist), Priscilla Gates (Stem Cell specialist Nurse) and Samantha (Oncology Administrative). 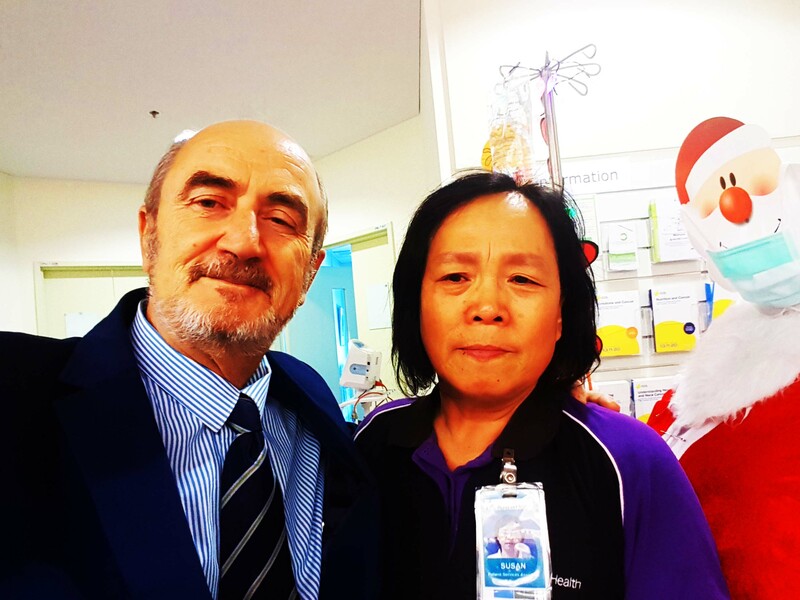 Then I made my way to the cancer ward to pay my respects and wish everyone a Merry Christmas and a Happy New Year. I met some of the staff who were happy to see me alive and well, each commenting that they don’t often get patients returning. It was wonderful to see Eleanor (Oncology nurse) and Emma (Oncology Matron/Manager). I left a message on a long sheet of paper, created for all those who wanted to leave good will and wishes. A copy of that sheet is attached. As I was about to leave, I spied Fay in the corner with her hand on the mop which was in the bucket and I said “hi Fay, it is wonderful to see you again”; Fay looked and looked, staring at me and finally started crying when she recognised me. The last time we saw each other, I was pale, thin with no hair on my body. We both hugged each other and exchanged pleasantries and I gave her my details. We wished each a Merry Christmas and a Happy New promising to keep in touch. Fay said between her tears that seeing me well was the best Christmas present she had received. As I left and went to the lift, I am sure that it was raining because I had raindrops on my cheeks. The moral of this true story is that no matter what station or status we have in life there are good people to be found everywhere. FAY WAS ONE OF THE MANY WHO HELPED ME THROUGH MY DARKEST PERIODS. FAY IS TRULY INSPIRATIONAL. Fay is one many dedicated individuals of ONJ CANCER WELLNESS CENTRE at the Austin Hospital. All of the team from the Professor down to the humble cleaners are committed to making life worthwhile. 2017 was laced with sadness with the passing of family friends and acquaintances and yet despite their passing, I have become the recipient of their memories and will not forget their contribution to making me who I am. Life as we know it can only be sustained by vigilance and with that vigilance comes responsibility.